On Tuesday, October 5, 1937, the Fine Arts Club of Little Rock held its first meeting in the new Museum of Fine Arts. But it was not a typical meeting. It was an Open House and Dedication for the new building. Construction on the 10,140 square foot building had commenced with the January 3, 1936, groundbreaking. By September 1937, the keys were presented to the City, marking the end of the construction process. During the October 5 events, a letter of congratulations was read by President Franklin D. Roosevelt and WPA Administrator Harry L. Hopkins. A letter which had been prepared by Sen Joe T. Robinson prior to his death was also read. Mayor R. E. Overman, architect H. Ray Burks, and Fred W. Allsopp spoke at the event. The latter was chair of the museum’s board. Over 1,000 people were in attendance. At the time the city’s population was around 87,000. The museum officially opened its doors to the public on October 28, 1937. 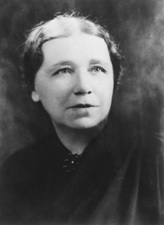 Irene Robinson, a longtime member of the Fine Arts Club, was its first director and would serve in that capacity for two decades. The original facade of the Museum can still be seen inside the Arkansas Arts Center. Once the expansion and renovation of that building is complete in 2022, the original entrance will be highlighted even more with the new design.